A special guest post by Chris Makara to help nonprofits, NGOs and Social Enterprises understand the benefits of Social Media Automation. With the ever-growing number of people on social media, using these channels to support marketing efforts should be on every company’s agenda. This is no less true when it comes to nonprofits. In fact, social media’s low barrier to entry, ease of management, access to local and remote markets, etc. helps make it even more attractive to these types of organizations. In fact, when you’re running a nonprofit, you have many unique ways to leverage your social media presence, depending on what your ultimate strategic goals are and what audience you’re trying to reach. But with limited resources and, oftentimes, more volunteers on-hand than employees, you may find yourself lacking the billable hours necessary to take on all the day-to- day work involved with social media marketing. You need to make the biggest impact with the time you have. How? Through social media automation. What is social media automation and how does it work? 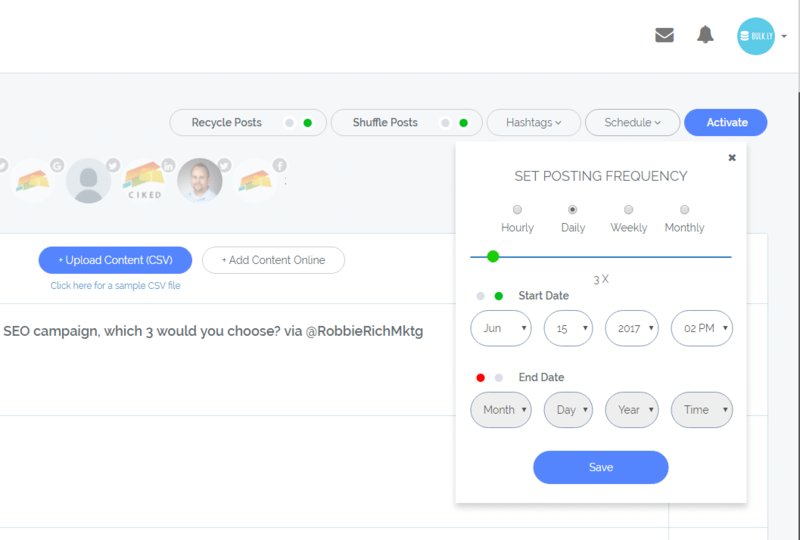 By scheduling a set-it-and-forget-it stream of posts to keep your accounts active on a continual basis, you’re saving countless hours otherwise spent on daily social media management. You can then turn around and invest the time you save into bigger, better strategies – for bigger, better results. Say you decided to use my social media automation tool, Bulkly. If you don’t already have one, open a Buffer account and connect your social media accounts to it. They do have a free plan, but I recommend getting a paid one. It’s only $10 a month and it’s a must-have in order to use Bulkly to automate your social media channels. Identify the content you want to share – be it content from your blog, content from partners’ blogs, articles from your favorite websites – anything, really. Just make sure whatever content you’re posting is “evergreen”, meaning it will always be relevant to readers vs. time-sensitive news posts or trendy updates. Add your social media update copy and URLs into a CSV file (templates available for download in Bulkly’s content upload section). Upload the filled-out CSV file to Bulkly’s content upload section. Adjust the posting schedule to your preferences. These posts will now be sent to Buffer to fill up your queue and start getting shared with your followers according to the schedule you’ve selected. By eliminating the daily efforts of sourcing content, posting content, adjusting schedules, etc., you can start focusing on the things you should be doing to make your nonprofit’s social media marketing efforts really stand out. Ready to find out what those things are? If you’re running a successful nonprofit organization, you already have a good grasp on what audiences you’re targeting and what strategies you’re using to reach them. Based on that knowledge, here are a few strategic ideas to keep in mind for your social media marketing strategy – and how your newfound use of social media automation will support your efforts. Nonprofits commonly make the mistake of only using social media during the span of time leading up to major volunteer events or fundraising galas…and then leaving their accounts largely inactive during the time in between. People are on their social media channels every day, interacting, posting, sharing, and they choose to follow others who are doing the same. They may choose to follow you based on your activity leading up to a major event, but then, when you go on radio silence for the two months following, they eventually lose interest and move on. So when you start posting again, they’ll be waiting for you to drop off again, and will thus be less likely to take the time to share or engage with your updates. Utilizing a social media automation tool like Bulkly can really help you avoid the between-events slump. With a steady stream of evergreen posts keeping your followers interested and interacting, all you’ll need to do is monitor your channels and respond to comments or questions – all the while putting in the time needed to plan for your next major volunteer meeting or outline a new way of promoting your yearly holiday gala. You stand for an amazing cause. People want to help make your efforts come to fruition, whether you’re feeding hungry children or caring for shelter animals. But not everyone that wants to help has the time or money available to do so. You know what’s free and takes less than 30 seconds to do? Share content on social media. By making your updates easy to share, with clear calls to action, enticing pictures and concise, engaging copy, followers won’t hold back when it comes to sharing your content on their channels. And the more your content is shared, the greater the chances of your message reaching the right people – the people who are willing (and wanting) to help. You may not always have the extra time in your schedule to create and share posts like these every day. But investing in social media automation lets you make the best use of your time. By taking a few hours, one day, to put together a CSV file filled with evergreen posts – optimized to encourage sharing – and uploading these into a tool like Bulkly, you’ve got this action item covered for weeks, maybe even months ahead. The best part is you can continue adding new updates to your groups in Bulkly (when you have the time) to increase your collection of scheduled posts – and still be continuously sharing updates in the meantime. So you never lose traction, no matter how busy your schedule is. You run a nonprofit. You and the people who work, volunteer, donate, speak, etc. for you are all doing it because they have a passion for a cause. Why do you do what you do? What inspired you or someone before you to support this cause? What incredible people did you lean on to help you get this company where it is today? You have the opportunity to tap into these emotions and develop strategic social media campaigns around them to share with your followers. Then, they too can embrace your cause the way you have and spread the word, donate, volunteer – whatever your ultimate goal happens to be. With your social channels running on autopilot, you can take the time to craft out unique campaigns geared toward each of your goals and share them according to the schedule you decide will be most effective. 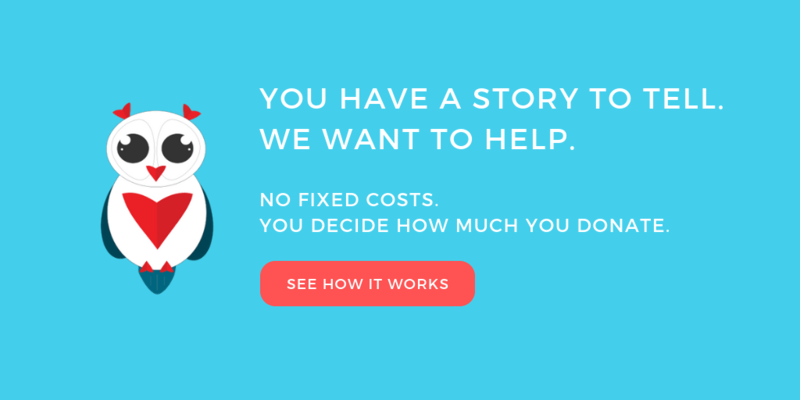 If there’s anything more powerful than sharing the inspiration behind your cause, it’s sharing the before and after stories of the people (or animals) your organization has helped. People want to see how your volunteers and their donations better the lives of others – and seeing this in action is an extremely compelling way to get them to contribute. You need carefully selected images. Thoughtful content. A carefully planned posting schedule. You also need enough of a follower base to share these stories with and further extend their reach. Without any one of these things, your before and after stories won’t make as great of an impact on your audience as you might have hope. Keeping your accounts continually active through social media automation not only affords you the extra time to spend building out these high-impact campaigns, it also maintains your steady base of followers so when you’re finally ready to deploy, you’ll have people to share it with, and share alike. As mentioned earlier, the most effective way to reach your social community as a nonprofit is by tapping into the passion and emotion behind your cause. But you won’t be getting anywhere without good imagery to back the content you share. Got pictures from past volunteer events/fundraisers/galas/etc.? Use them! Where they make sense, of course. But you might not always have a photo that properly speaks to the article you’re sharing or the request you’re making. DO NOT use stock images, figure “it’s fine without an image” or “borrow” an image from someone else’s website. All of these are bad ideas. For many reasons. DO check out Canva. It’s a free online tool that allows you to create and download unique images using colorful backgrounds accented by graphics, designs, text, etc. You can even select different-sized templates, depending upon your specific need (Facebook image, Pinterest image, etc. ), and upload your own images as backgrounds or accents. It’s really easy to get the hang of – but you do need put some effort into it. And when Bulkly’s keeping your social media channels active on the regular, you’ll have more than enough time to create fresh images for every new blog post or event update. You might have acted with your heart when it came to establishing your nonprofit organization or kick-starting your last major fundraiser – but some things work best with a little research to back them up. Social media is one of them. You’re utilizing social media automation to afford you the extra time to invest in designing before and after campaigns, creating unique images, engaging with your followers…but what has the most impact? Are you reaching the right audiences? Could you better engage people by sharing different kinds of content from different sources? You can answer these questions by digging into your social media analytics. Some channels like Twitter offer separate tabs within your account to view engagement, shares, etc. on specific posts and track their performance over adjustable time spans. If you prefer seeing all of this data in one convenient place, you may want to consider investing in a social media tool like Google Analytics, Hootsuite, Moz or HubSpot. Many of these are relatively inexpensive and offer tutorials to help you navigate their platforms if you’re using them for the first time. Saying that the work you do as a nonprofit organization is important is an understatement. Your efforts could mean the difference between someone going without food and having food, losing faith in people and believing in them…or even the difference between life and death. Every minute of time you put into your business should be optimized to further the goals of your cause. Not wasted doing frustrating, repetitive work. Use social media automation to put your tedious posting and scheduling tasks on autopilot – so you can focus on what really matters: building smart campaigns and engaging with your audience. For you, it could mean the difference between success and failure. But for those your nonprofit supports, it could mean a whole lot more. Want to receive more tips on how to become more successful with your Nonprofit, NGO or Social Enterprise? Sign up for the mailing list below to receive insights every now and then.